To really measure the environmental impact of a project, you have to look at what it replaces. When you compare the before and after, side by side, you can see the true impact on environmental factors such as: population density, number of cars, street parking, stormwater runoff, air flow, noise and light. 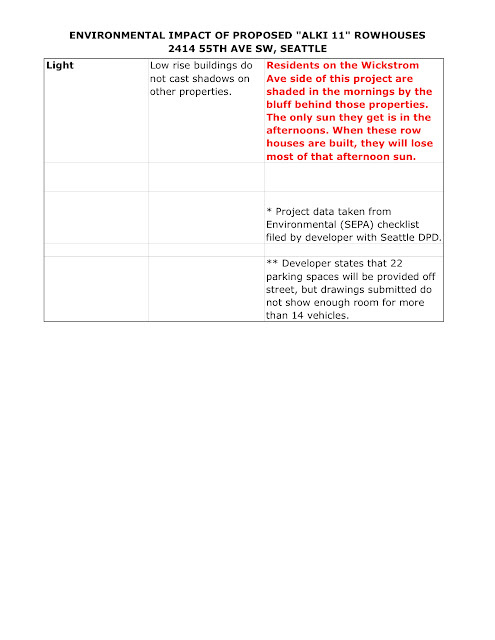 The spreadsheet below describes what exists on this property now and how each of these elements will change if this project is built. All items in red type indicate ways that this project will have a negative environmental impact as compared with what is there today. Note in particular how many more cars will be parked on the street and the amount of stormwater runoff this project is expected to create. Stormwater runoff is the #1 source of pollution in Puget Sound. Here are the steps you can use to evaluate any project you are concerned about. First, take the square footage of the roof area. In this case, we're going to use the square footage of the combined building footprints since we don't have actual roofs to measure. According to the developer's Environmental (SEPA) Checklist, this is 5,511 sf. Now multiply the square footage by 144 to get the number of square inches. 5,511 X 144 = 793,584 sq. in. Multiply the number of square inches by the amount of rainfall to get the number of cubic inches. In this case, we'll use one inch. There are 231 cubic inches in one gallon of water. So to find the number of gallons of runoff that will come off these buildings after one inch of rain falls, divide the number of cubic inches by 231. Using the same process, here's the amount of runoff that will come off the Alki 11 autocourt. 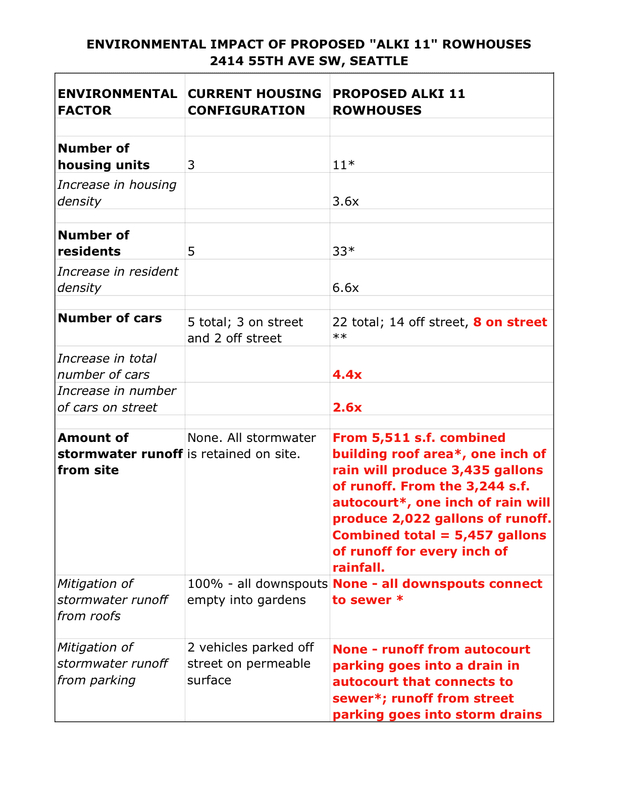 For comparison, this rowhouse project would replace housing that has zero runoff - all stormwater from roofs and parking is currently absorbed on site. 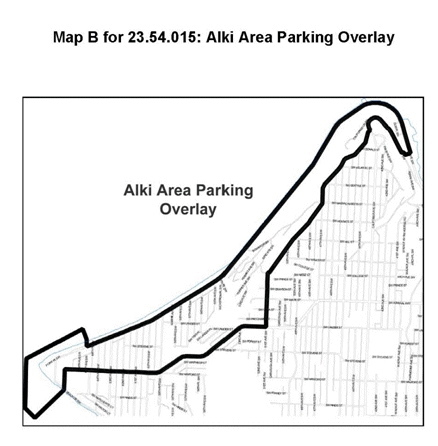 In an earlier post, I showed a map of the Alki Parking Overlay. Within this area, developers are required to provide 1.5 parking spaces for each dwelling unit. This supersedes other city-wide parking regulations which allow for fewer off-street parking spaces. The reason for this is that Alki Beach is a destination for the rest of Seattle, especially in the summer months. If you live here, you know that it is nearly impossible to find street parking, even when there aren't visitors. This special parking requirement is intended to provide more off street parking and reduce congestion. The site of the proposed Alki 11 is located inside this parking overlay. So following this formula, 1.5 spaces for each dwelling unit, the developer of this project is required to provide 16.5 off street spaces. In the developer's SEPA statement he claims that there will be two parking spaces for each unit, for a total of 22. But is that even possible? The standard size for a parking space is 9 feet wide and 18 feet long. "Compact" spaces are 8 feet wide and can work in open parking lots where there is more room to maneuver. They are too narrow for garages because drivers have to contend with garage doors and walls. And once they are inside the garage, there's not much room to open car doors or walk around vehicles. Developers often fudge on garage sizes in townhouse autocourts in order to cram more units onto the property, which is why people who live in those buildings park on the street. There's no reason to expect that this project will be any different. The minimum size for a 2-car garage is 20 feet wide and 20 feet long. But it is difficult to park SUVs and pickups in garages that size, so builders and architects are now recommending that garages measure 24 feet wide and long. Each rowhouse in the Alki 11 will have an attached garage, located under the unit. In order to accommodate 22 cars, there would have to be space for a two car garage at the base of each rowhouse. However, only three of these units are wide enough for a minimum-sized 2-car garage. This is in violation of the Seattle Municipal Code requirement of 16.5 spaces. If you are curious about a project and want to review the documents filed with the city so far, go to the Department of Planning and Development (DPD) search page. On that page you have two choices for searches. 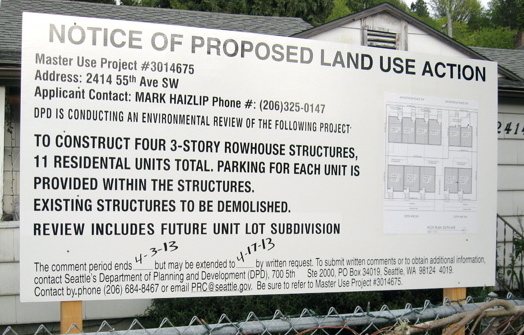 On the left, you can enter the Master Use Project number, which you will find listed on the Notice of Proposed Land Use Action sign posted on the project site. The project number for the Alki 11, for example, is 3014675. The second search option is to enter the address of the project. When you bring up the project records, you will be able to view: documents submitted by the developer, including architectural plans, an environmental check list, comments submitted by the public during the comment period, correction notices from DPD planners, and more. There can be up to three days lag time from when a document is received by the city and when it is posted on the site, but eventually it is all there for the public to review. If you want to find out if a permit has been issued or if complaints have been filed, go to the DPD's Permit and Complaint Status page. You will have the same search options. 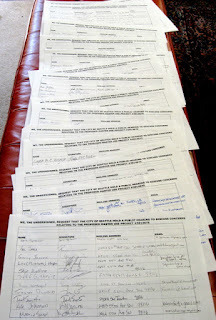 When you bring up those records, you will find out: the name of the developer, when the permit was applied for, what the zoning is, legal description of property, description of project, related building permits, etc. Between the two searches, you should be able to get a good idea of where things stand. We have a right to know this information and knowledge is power! 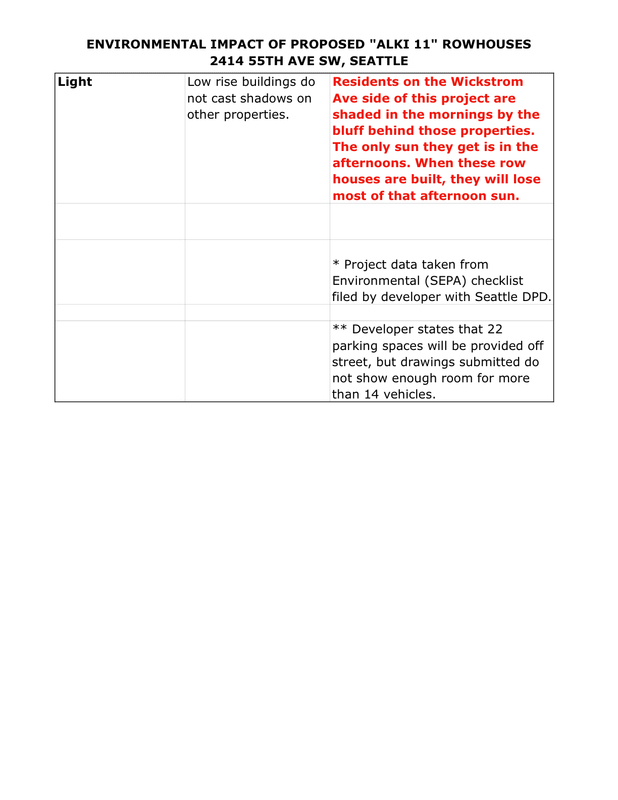 How Many Parking Spaces Are Developers Required to Provide in the Alki Neighborhood? The short answer is this: For every dwelling unit within the Alki Area Parking Overlay (see map) developers are required to provide 1.5 parking spaces. For the long answer, follow the link below to Chapter 23.54 of the Seattle Municipal Code. When you get there, you will find a long document that explains parking requirements for buildings and institutions throughout the city. 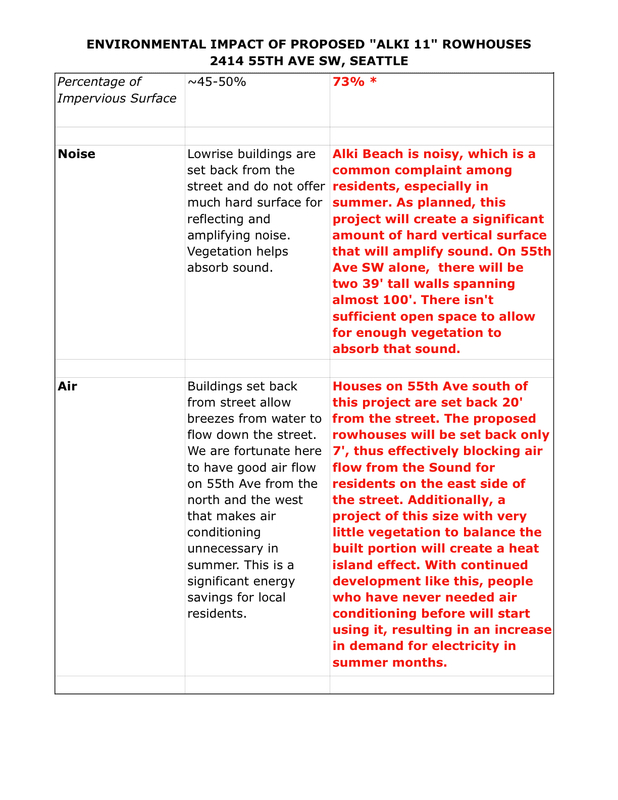 For specific mention of the Alki neighborhood, scroll down to Table B, "Parking for Residential Uses," then scroll down to item "O." 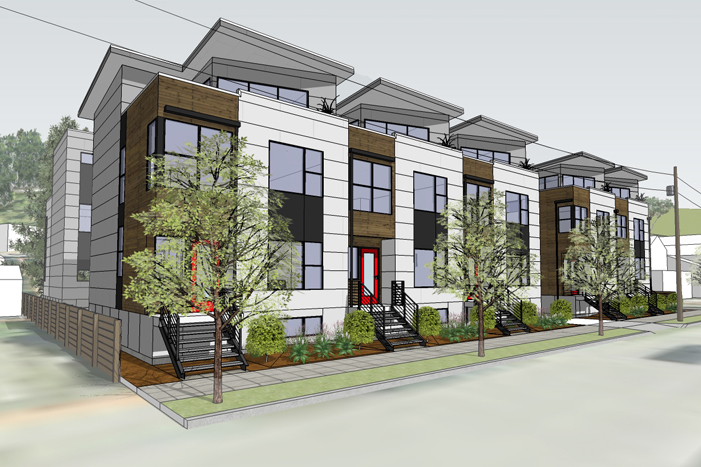 What Would the Alki 11 Rowhouses Look Like? 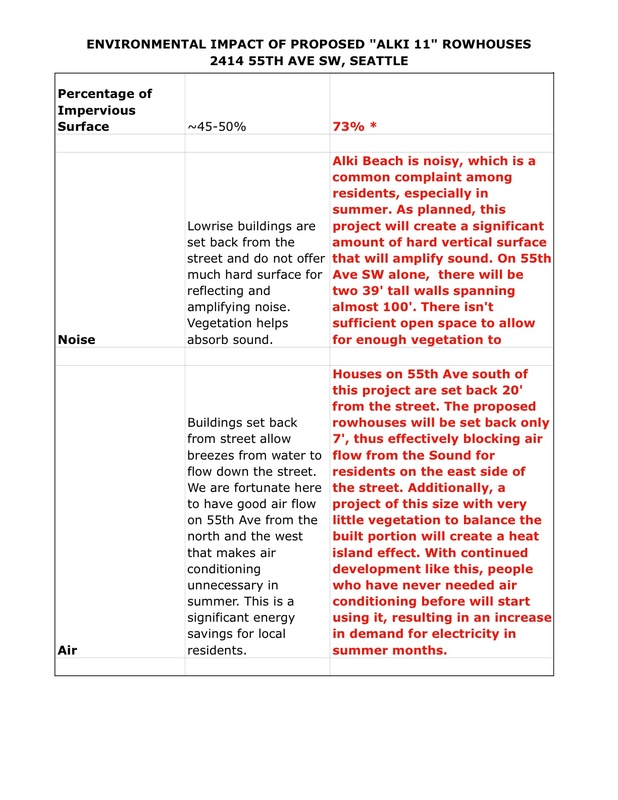 I can tell you that the proposed Alki 11 rowhouse project is way out of scale for the neighborhood, but words can't communicate just HOW much out of scale. For that, you need pictures. Let's start with what's on that property right now. These three little cottages were home for a total of 5 people, all of whom were evicted to make way for this project. The Alki 11 is expected to provide housing for 33 people. 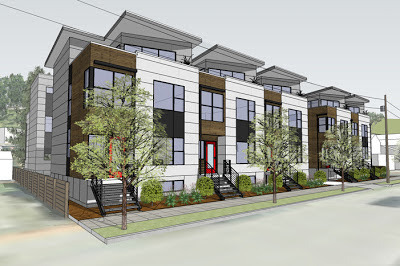 Here is an architect's rendering of what the Alki 11 rowhouse project will look like on the 55th Ave SW side, with 5 units facing the street. 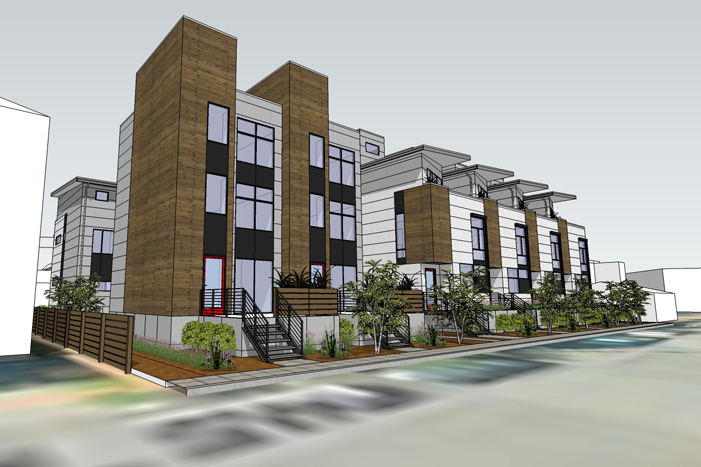 And this is what it will look like on the Wickstrom Ave side, with 6 more units facing the street. The project is so densely built, that only 14 to 16 of the 22 cars it will add to the neighborhood will have off street parking. An estimated 6-8 cars will have to park on the street. For comparison, here are two multi-family buildings on the same block. They do not have additional houses behind them. There are 5 households (10 residents), plenty of green space and off street parking for all but one car. Density doesn't have to mean sacrificing green space or parking. 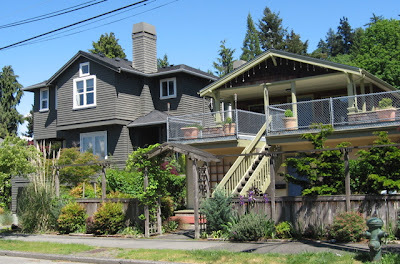 Right sized developments, thoughtfully designed, can improve a neighborhood. If you have examples of good design in your area, please leave a comment and give the address. Let's use those positive examples to create a vision of what we want for our community. A proposed "row house" project has mobilized my Alki Beach neighborhood in a way that few events, short of natural disaster, can. We knew for several months that development was planned for three lots on our street. The rumor was that it was going to be a townhouse complex. No one seemed upset by that. But when the land use sign went up and neighbors started looking at what was being proposed, the consensus was, "Whoa!" Townhouses are one thing. Row houses are another. Townhouse developments are required to provide off street parking for their residents and include green space to mitigate environmental impacts. But row houses are not. Our little beach community has serious parking problems because it is a destination for Seattlites on sunny days. The runoff from this development will flow directly into Puget Sound, 1/2 block away. If this development is allowed to go forward as proposed, it will add to our existing parking and water pollution problems. It will block views for many neighbors, with 3-story buildings set just 5 feet from the sidewalk. I could write a lengthy post about all that is wrong with this proposal. But for me, the most interesting thing about the situation has been how neighbors have come together to express their concerns and communicate them to the City. It began with one neighbor photographing this sign and emailing it to others, alerting us to the fact that the comment period was pretty short. Several people wrote the city to request a two week extension and we were granted that. Then at least 6 people wrote to Seattle's Department of Planning and Development, expressing their concerns about various aspects of the project. Their comments (including mine) are part of the public record, which can be accessed at the DPD website. Enter project number 3014675 and wait a minute for the records to come up. You'll find all documents pertinent to the project there. After the comment period closed, we asked the city when we would get a public hearing to discuss this project. We were told that public hearings are not part of the process for these types of projects, but that the city planner might give us a hearing if we submitted a petition with at least 50 signatures. I remember saying to neighbors when we got the news, "I can easily see us getting 20, but 50?" The great thing about this neighborhood is that we are a close community. We get along well, many of us have become friends over the years, and we do things together like summertime potlucks. Because I've been one of the potluck organizers, I have email addresses for many neighbors. So I sent an email to my list, explaining my concerns about the project and that we needed to get a petition circulated ASAP. 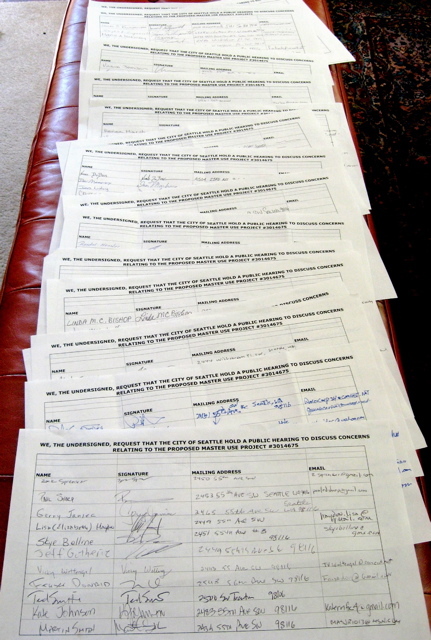 Over the next couple of days, 10 people came forward to offer to gather signatures. We quickly got the required 50 (one neighbor collected 55 by himself!) and went on to collect 2-1/2 times that many before the deadline. In the process, friends became closer and acquaintances became allies. We were drawn together in a way that made me appreciate this neighborhood more than ever. Will we get our hearing? It's only been a few days since we submitted our petition and we haven't heard anything yet. But whatever happens, we are a better community for having had this experience.